TMobile, Verizon, Sprint, Nextel and Alltel. New Jersey School for the Deaf. state superintendent Kathy Cox have promised them. the schools, as she promised. office of Judge and Bankruptcy trustee, Gary W. Brown. we have had a number of deaf clothing designers. will be displayed at a fashion show. please read the announcement posted in the Blue edition. established by DOT for drivers of commercial motor vehicles. Justine Henin and Kim Clijsters. Belgium has 3 languages -  Dutch, French and German. had to communicate with each other in sign language. times are correct, etc, etc, etc. think captions are not important! Hitchcock movies and TV shows to his credit. in Buffalo, NY, attending a family wedding. and as a matter of coincidence, he had to smile. in London. Just cannot get away with it in USA. sign that was visible and clear to anyone. also not be a blessing for hearing tourists. 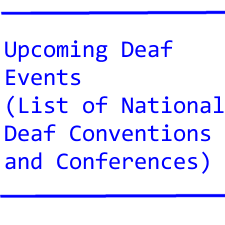 whereas we, the deaf, are so unaware! the Emergency Crisis Hot Line telephones. deaf that may be in need of assistance. that a CI is the best bet. opened quickly came up with a knife in his hand. Luckily for me, he put the knife away! An asylum for the deaf and speechless? Many deaf people can speak so why are we speechless? president lies with the board of trustees. Year 1948 - Archie Stack graduates from Gallaudet. 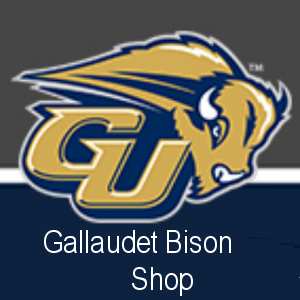 Gallaudet to resume his studies. and claim deduction on taxes? Education, Linguistics or related field required. and communicative components) at post-secondary level. office. Lab testing with individual cameras. and fill out an online application under jobs. these universal rights are promoted and protected. Advocates is an EOE committed to employing a diverse workforce. technical college serving deaf and hard-of-hearing students. RIT with 16,000 hearing students. chemistry, biology, mathematics and physics. RIT's core values, honor code, and statement of diversity. Experience working in behavioral health setting preferred. American Sign Language training provided on site. FT and Per Diem, all shifts available.